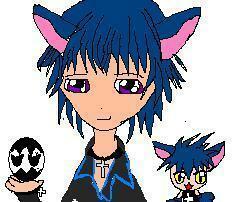 Ikuto and Yoru. I made this picture with paint.. Wallpaper and background images in the Shugo Chara club tagged: shugo chara!! doki shugo chara ikuto yoru. I made this picture with paint. This Shugo Chara fan art contains anime, comic, manga, cartoon, comic buch, karikatur, and comics.